Also referred to as the Hieronymites Monastery (from the name of the first community of monks who populated and to whom the monastery was entrusted), the Jeronimos Monastery is undeniably the most prestigious place of worship in Lisbon. King Manuel I was the one who commissioned its construction, the works being completed in 1502. At present, the monastery is, together with the Belem Tower, listed as a World Heritage Site by UNESCO (in 1983), which is no surprise given the architectural uniqueness and the historical background of this edifice. Thus, as said, the monastery was built in 1502 in order to commemorate the naval journeys and achievements of Vasco da Gama, one year after the beginning of the construction works. The architect commissioned by King Manuel I, Doigo Boitac, designed the edifice in a striking Manueline style, which stands out as a lushly ornate Gothic style, bearing the very name of the king who had the monastery built. 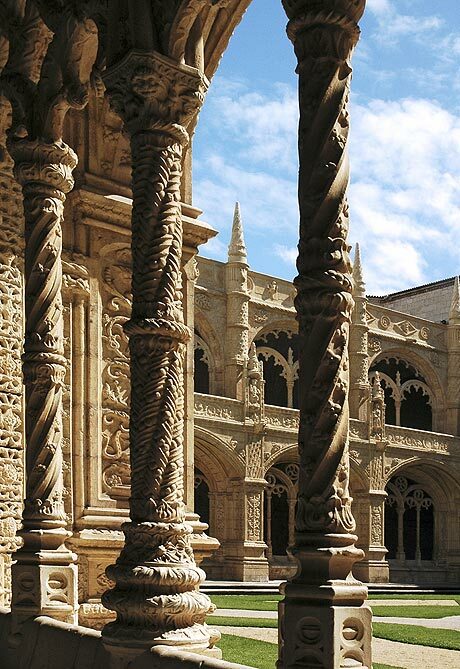 The construction of the monastery, as well as the development of the Manueline style, was related to the naval breakthroughs of Portugal in the age of the great geographical discoveries. This aspect is, in fact, mirrored by the marine and seafaring motifs which prevail across the decorative motifs of the elements: corals, sea monsters, coiled rope. The church of the monastic complex is dedicated to Santa Maria, and, as compared with the rest of the monastery, it is the most spectacular of all architectural sections. Doigo Boitac was again the one who laid the foundations of the church, but his work was continued by a Spanish architect, Juan de Castilho, who must be credited for the architectural and decorative merits of the church. The latter architect also contributed with the addition of certain floral motifs, typical of the Renaissance style. The monastery is also the place where the tombs of Vasco da Gama and Luis de Camoes, the great poet who praised, through its lyrics, the achievements of da Gama, are located. Poets Fernando Pessoa and Alexandre Herculano and Kings Manuel and Sebastiao are also entombed here. Furthermore, the west wing of the monastery, which was built no sooner than the 1850s, is now home to two of the most notable museums of Lisbon: the Maritime Museum and the National Archeology Museum. The garden of the monastery is also worth the attention: it is centrally pegged out by a monumental fountain decorated with the coat of arms of Portugal. Holders of a Lisbon Card can visit the monastery for free.